Networking is only a set of skills and once you know what they are and have practised them, your confidence will grow. Networking is about building relationships. We do this all the time, with the person we see every day at the local coffee shop, with our colleagues and with people we become friends with. However, for some reason when we introduce the word “networking” in a business context, many people freeze. At the end of the day a ‘relationship’ at whatever level is only a relationship and nothing. 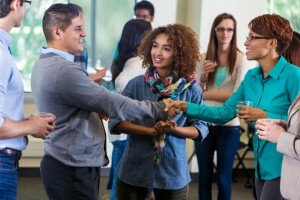 People feel anxious and uncomfortable at the thought of networking as they believing they do not know what to say and will come across as boring. People fear what is usually called “small talk. However, as many practised conversationalists know it is possible to have an excellent conversation by getting the other person to do most of the talking. There are different types of questions. The two most common types of questions are called Closed and Open Questions. Closed questions are the ones where it is only possible to give a ‘yes’ or ‘no’ answer. For example: Do you like your job? Would you like a coffee? Closed questions are useful for fact-finding but do not encourage the other person to open up the conversation. If you ask closed question you will find that this usually has to be followed quite quickly with a further question. Another type of question is called an Open Question. Open questions are questions that encourage the other person to talk more freely about him/herself. When you use open questions, the other person has to expand their answers. Open questions start with words such as What, Where, How, When and Why. For example,” what attracted you to work for your company”? “How do you come to know Mike”? “What would you say is the greatest challenge facing the industry now”? “Why would you like travel to the Amazon”? “Where would you suggest I find that information”? Once the other person starts to open up, providing you with information on one topic you can then use further open questions to find out more. For example, “how did you come to know Mike?” might get a response such as, “I met him at the Squash Club and we’ve know each other for a few years and our families have become quite good friends. We went on holiday to Portugal recently”. Not only have you learnt more about Mike but also about the person you are talking to and you can build on this information. For example, “I didn’t know Mike played Squash, I’ve never played, what attracted you to the game?” or “Portugal, that’s somewhere I have never been, how did you find it?” If you listen to what you are being told there are many opportunities to follow up with further questions and, as the other person is also likely to ask you about yourself, the conversation now takes on an easy style. This makes the conversation more interesting and relationships build by getting to know more about the other person. In addition to using open questions, many people have found it useful to remember the acronym OPEN as it provides a framework to hang their open questions on. To help you get familiar with using both Open Questions and using the Open Formula think about how many open questions, you can come up with and like everything else, the more you practice thinking about types of questions the more questions will come to mind. When you are learning a new skill, remember that practice makes perfect. Start by using your open questions wherever you can, with family, friends and at work. When you feel that you can manage these think about all the situations you may be avoiding due to your fears about talking to others and then armed with your open questions start using your open formula. You no longer need to avoid or be fearful in any type of social situation.